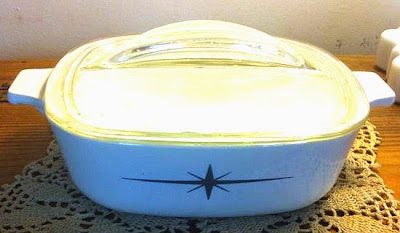 CorningWare 411: Seein' Stars - Unknown Black Atomic Star Pattern?? Seein' Stars - Unknown Black Atomic Star Pattern?? It all started with a conversation on Facebook in one of the Corning Ware collector's groups... 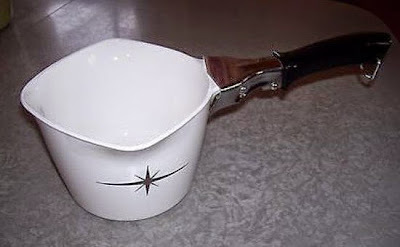 Someone had found a 2 1/2 quart saucepan with an elongated black star pattern on it. None of us actually knew what the name of it was, cause none of us have seen a boxed piece. Up to that point, the only piece I had ever seen was a chipped and cracked 4 quart P-34-B dutch oven on Etsy over a year ago. I did not purchase it, nor did I archive a picture of it. At the time, I assumed it was just a test pattern piece, and I don't really collect those. Several names were thrown out from Black Star and Atomic Start to Hyper Space and Event Horizon. I contacted CMOG via email, but have not heard anything back yet... Honestly, I am still waiting on a reply to an email I sent 6 months ago regarding the Green Wheat/Harvest Wheat/Wheat Floral pattern. I figured I should have at least 2 pieces in my possession before I wrote a blog post about it. Not that I am going to be able to do a "Big Reveal" on the name or anything, but this post will provide at least SOME information out on the internet about this pattern. So to date, even though none of us know the name of the pattern and CMOG has not been forthcoming via email, we know there is at least a 1 quart, 1 3/4 quart & 2 1/2 quart saucepans, a 4 quart Dutch Oven, a P-21 13 inch Roaster and a 1 quart Saucemaker. There even seems to be a Percolator. That seems like an awful lot of pieces (7) for it to have been simply a test pattern. This leads me to believe it may have been one of the patterns made available to Corning Employees in the Employee shop... Like the Christmas/Holiday pieces. Anybody out there have this pattern with a box?? Update: There is a similar pattern to this one, but with a more complicated star pattern. It has a medallion in the center of the star... This piece is a 1 1/2 quart size PH-1 1/2-B. It's the same type of "black", being sort of a dark gunmetal grey color with a slight sheen to it. Aside from this 1 1/2 quart dish, there also appears to be a PH-34-B (4 quart dutch oven) piece as well. Hi! My grandfather was a Lincoln/Ford dealer in the late 50's and early 60's. My grandmother had a set of these (casseroles only). My mom seems to think they were given out to employees of the Ford Motor Company, or possibly as "thank you" gifts to customers who bought Lincoln Continentals. Hence the starburst that looks like a sideways Lincoln starburst logo. Can't confirm, and my grandmother's set went bye bye in a yard sale back in the 80's. To add to Lisa's comment, since one of the stars she found today is coming to live with me. The marking on the bottom is P-1 3/4-B and only has the made in USA under it. No reference to stovetop or broiler. If that helps you date the pieces any better? I found a stove top percolator today in this pattern which I had not seen before. The pieces here are the only I've ever seen. If someone can tell me how to post a photo here I will. You can email photos to "corningware411@gmail.com"
So my piece came in the mail today and the star is actually a metallic gunmetal/silver color, not black. It reflects in the light. It also seems to have just slightly thicker lines on the shorter rays of the starburst versus the photos you have posted. It could just be my eyes. So just wondering, are the stars on your pieces flat black or metallic? I was noticing that about the 1 3/4 quart... It's not really a "black", more of a dark gunmetal grey with a hint of a shine to it.. almost metallic, but not as shiny as the Platinum Filigree pieces or the Platinum Starburst percolator. Is yours P-21 Open Roaster or the P-76 Open Roaster? I found a starburst casserole dish today. On the bottom: 1 3/4 QT. P-1-3/4-B Made in U.S.A.
Just under the "B" is a period mark like that found after T,U,S and A. This dish shows wear; It will be on Ebay soon. I acquired a 5qt Dutch oven in this pattern today. Three years later and the information on this pattern is still as elusive as a unicorn.